Civilians in the besieged town of Madaya are suffering from staggering levels of need. Up to 40,000 civilians are starving, forced to resort to eating plants, insects, and even cats to survive. 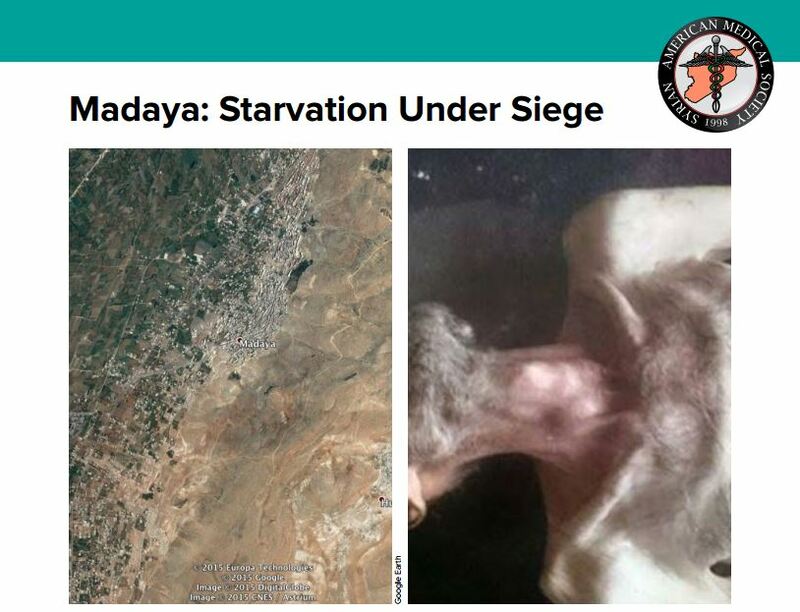 SAMS’s latest report, Madaya: Starvation Under Siege, underscores the horrors that civilians are experiencing in besieged Madaya, and the need for consistent and sustained humanitarian access to the town. The report charts the deaths 31 civilians in Madaya during December 2015 from starvation, landmine injuries, and sniper injuries, and gives an overview of the one medical clinic in Madaya. The clinic sees around 300 patients a day, over half of them children under the age of 10, with the majority exhibiting malnourishment and symptoms of protein impairment diseases. There is severe shortage of medical supplies and medications in the clinic and there are no specialized surgeons, baby milk, vaccinations, antibiotics, anesthesia, or oxygen.